HE-HO! Pittsburgh’s First Health and Housing Fair for Artists. 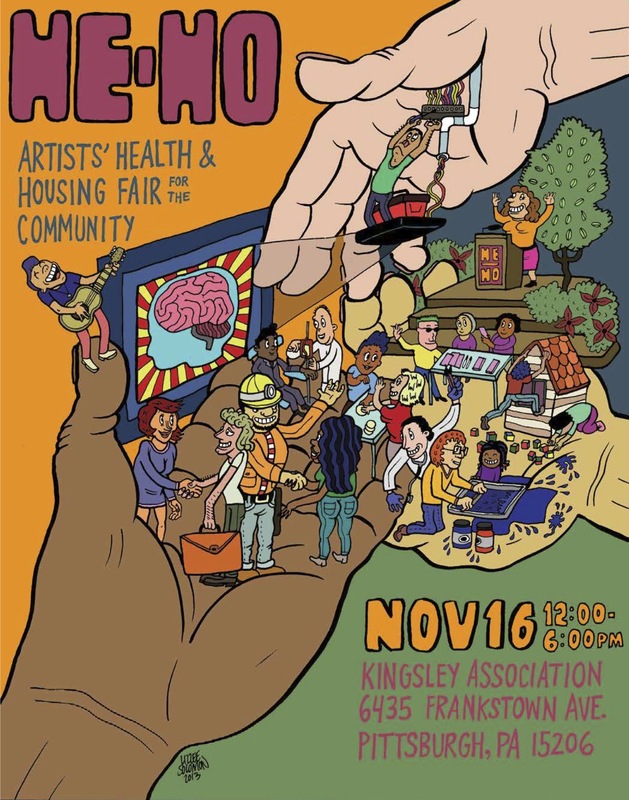 Pittsburgh’s very first HE-HO: Artists’ Health and Housing Fair will kick off this Saturday, November 16th 2013! We’ve got a full day of awesome, free programming from 12 noon – 6 p.m. at the Kingsley Association in East Liberty. Not just for artists, HE-HO is jam-packed with resources to lift our community with the tools to thrive as working people in our region: healthcare, housing, and art! What will happen at HE-HO? Well, a LOT. Free massages, health screenings, mortgage experts, food truck with Bella Christie, poster exhibition by Healthy Artists, jazz vocalist Anqwenique Wingfield, Delicious Pastries (a pop-rock band, not a danish) – even *bling* your cane or HE-HO tote bag with the Pittsburgh Center for Creative Reuse’s awesome recycled materials. Longtime GPAC friend PhatManDee will perform as will the wordsmiths – poets Grits Capone, Christina Springer and Nikki Allen. Win the 50/50 raffle and check out Healthy Artists’ film screening of the documentary, Healthy Artists (the movie!). FREE CHILDCARE will be provided! Dynamic programs will feature short workshops with experts on how to navigate the Affordable Care Act; home-buying workshops, and information about getting the healthcare you need in 2014. Already own a home? Then, find out how to improve your home with grants and loans with the Urban Redevelopment Authority. Need a home loan? Find out how to get one from lenders who specialize in lending to single mothers, for example. The point: get what you need to thrive. That’s why GPAC’s Pittsburgh Artists Advisory Committee came up with HE-HO, just for you. Get more information on HE-HO including location directions and workshop times, by visiting the HE-HO page on GPAC’s website. RSVP on our FB event page too, while you’re at it! Nov. 19th Event in The Pitt News!